Marvellous award-winning treats from the very best contemporary children’s writers. Build your home library with the crème de la crème! This vibrant selection highlights award-winners which have swept the boards in recent years, from the touching tale of the adorable Bog Baby to a hysterical winner of the Roald Dahl Funny Prize – The Witch’s Children Go to School! You’ll meet a real little monster, a wolf with a unique approach to life, and a shaggy little lion who’s a big softie at heart! With dynamic illustrations and a fresh contemporary feel, these clever, witty books will delight you – just like they did the prize judges! 10 o’clock is breakfast time for Mr Wolf! Can you spot the ten differences? Winner of the Association of Illustrators Gold Award for Mr Wolf and the Three Bears. Ursula was awarded the Nestle Smarties prize for Witch’s Children and the Queen and the Roald Dahl Funny Prize for Witch’s Children Go to School. Sean’s writing career began in 1994 – with Scholastic! – when he won the second prize in the Independent’s new writers’ competition, and his story was published in our anthology, ‘Story of the Year’. Since then, Sean has had numerous publications to his name (OUP, Frances Lincoln, Collins…), but it is in the last couple of years that he has been developing into a rising picture book star. Sean teaches English and creative writing to teenagers. 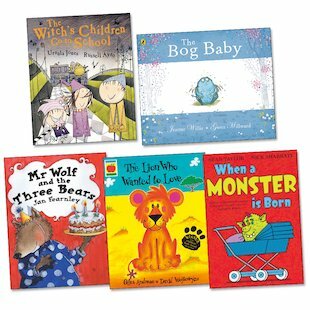 Winner of the Nestle Smarties and Portsmouth Children’s Book Prizes for When a Monster is Born. Jeanne has won several awards including the Nestle Smarties prize for Tadpole’s Promise, the Portsmouth Children’s Book Prize for Dumb Creatures and Grandad and John and the Book Trust Early Years award for Bog Baby. She has also won Red House award twice for Who’s in the Loo? and Bottoms Up!, both illustrated by Adrian Reynolds.